Charles Eck was bought out of the Roth firm by Charles Roth late winter of the 95 fan motor season. The Roth & Eck fan motor designed for the 95 fan motor season While Eck was still with the Roth firm is seen advertised with 3 names. The names are: Roth & Eck fan motor, The Acme fan motor through the Electrical Appliance Co. agency 95-96 fan motor seasons. It can be seen advertised as a Roth & Eck or "Hurricane"(Eck 97 trademark) fan motor when the remaining stock was sold off in 97. 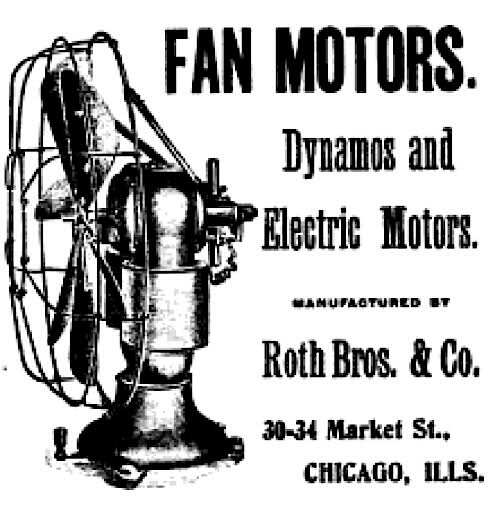 1897 Roth advertisement selling off remaining stock of the 95 design Roth & Eck fan motors through the east coast Roth fan motor agency. 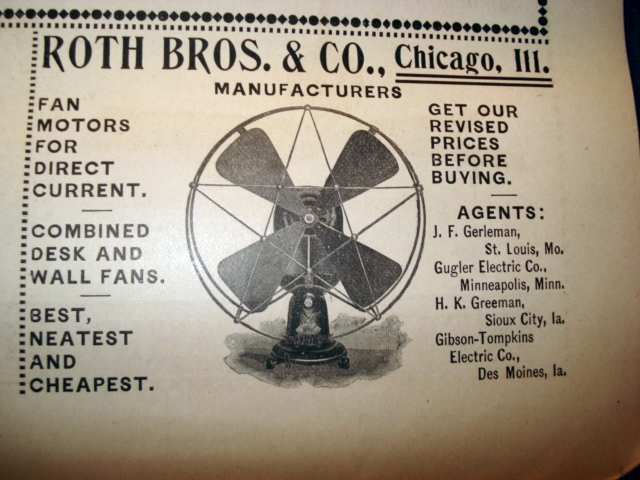 Roth Bros. had a new fan motor on the market same year. 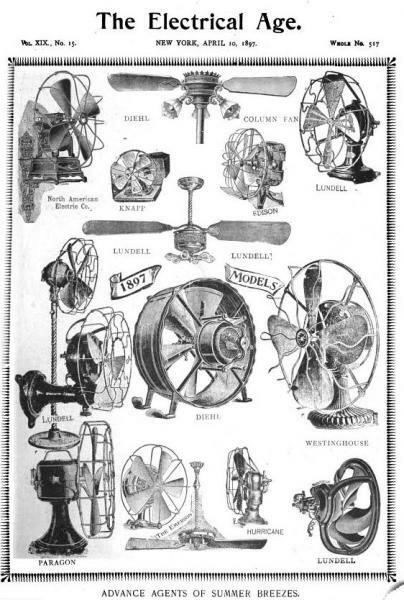 The 95 design Roth and Eck fan motors were sold with option of ON-OFF or 3 SPEED switches. Is this it? '94 continued into '95? 1895 Roth & Eck fan motor. Eck was bought out of the Roth firm by Charles Roth in March of 1895 BEFORE 95 fan motor season and AFTER the 95 model was designed. Eck's first fan motor on his own introduced 1896 with factory located on Wooster St. NY. 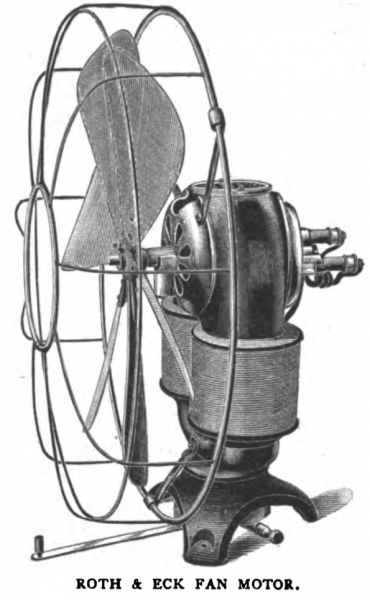 Roth's first fan motor without Eck 1897. I would like to see a photo of the real thing if anyone has one? Chris A. Campbell wrote: I would like to see a photo of the real thing if anyone has one? The earliest posted on the forum so far have been 2 97 G&W/Eck Hurricane frames. Prior to 97 the tag would read Roth & Eck(95-96), or Eck fan motor(96) from Wooster St. NY. There is the possibility of 95 model out there. So far not a peep of a 94. Roth utility Motor I believe. 2 Eck 96-97 model stumps on ebay. One with the tag above dates 97. 97 was Eck's first year with the Goldmark & Wallace agency. Eck's first fan motor without Roth hit the market in 96. If found the motor tag would not support the G&W agency. The 96 Eck was the only NY manufactured model on 116 Wooster Street. The Jandus Acme was in the Sears Catalog. The name Acme later became Kenmore. Page processed in 0.2080 seconds (24% database + 76% PHP). 30 queries executed.